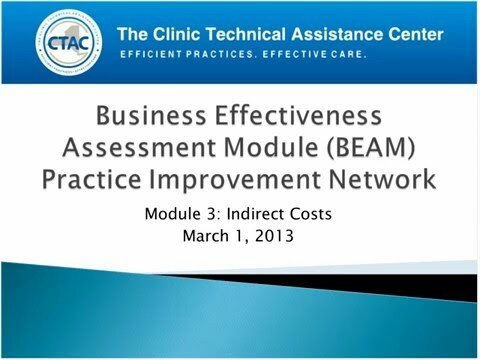 This module emphasizes the importance of clinic and financial leadership working together to identify the most effective practices that will help to drive down indirect costs and increase clinic revenue. Indirect costs are broken down into two main categories: non-controllable (i.e. rent, insurance) and controllable (i.e. staffing, supplies, etc.) indirect cost. A monthly generated clinic financial statement is crucial to the overall understanding of where a clinic stands: deficit or surplus position. Future considerations, such as going paperless and switching to electric records are some suggestions offered for clinics looking to cut controllable indirect costs down. Changes in the DSM-V are also noted as a cost consideration.